NEWSPAPER of the Year – The Fiji Times: This is the second year running it has won the Café Pacific newspaper prize. Although The Fiji Times went off the boil under Netani Rika’s leadership and headed for a disastrous demise with it uncomprising but unrealistic stance when dealing with a military regime, the newspaper wins the award again - this time for its change of ownership, change of tactics and a realistic overhaul of its strategic direction. Under the naïve management in the last stages of the News Ltd era, the 141-year-old newspaper was heading for closure under the 10 percent local ownership ultimatum under the regime’s Media Industry Development Decree. This fate would have sealed the end of any credible fightback for an independent media in Fiji. However, under the new ownership of the Motibhai group (“Mac” Motibhai Patel was a Fiji Times director for about four decades) and with the recall of a previous outstanding Australian publisher, Dallas Swinstead, to the hotseat, the paper now has the chance to fight another day. Neogotiation rather than confrontation seems to be the new approach under editor Fred Wesley. Time will tell whether this succeeds. 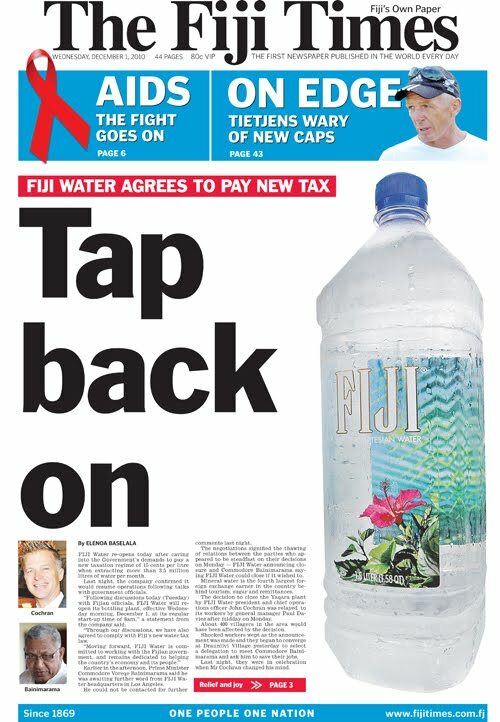 But paradoxically The Fiji Times also blots its copy book with the Most Toadying Story of the Year – a front page story on Fiji Water that ran as a sort of advertising wrap around given the marketing image displayed. 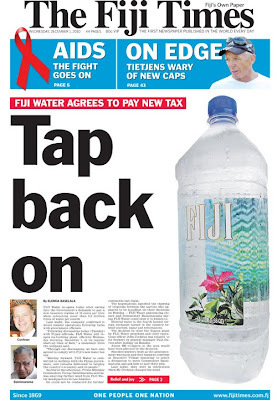 When the US-based company Fiji Water announced its closure this was a petulant response to a massive tax clampdown on the company, many breathed an “about time” sigh – they regarded the company as having exploiting Fiji for years. While some in the media fraternity expected the regime to cave in – as it had done on a previous attempt to boost the state tax returns - this time it was the company that surrendered with a reversal of its close down edict and a vow of business as usual. The Fiji Times needed to have published a more exhaustive inquiry into the economics of Fiji Water and also ought to have a higher level of scrutiny of other foreign-owned companies operating in the country. This is revelatory about the level of business journalism on the paper at the moment. Media film – There Once Was an Island: Te Henua e Noho: Strictly speaking, this isn’t a media film at all, but a powerful and heart-rending documentary about the realities of climate change in the Pacific, a film that every journalist working on environmental issues should watch. 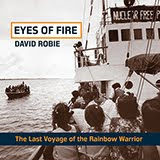 It is extremely educational about the power relationships between politicians in far-away Pacific capitals and their incompetent functionaries and island communities struggling for survival on remote islands with the political odds stacked against them. Filmmaker Briar March lived with the community on the Polynesian atoll of Takuu (also known as the Mortlock islands) as they wrestled with their life-and-death decisions over a move to the Bougainville autonomous region mainland some 250 km to the south-west. 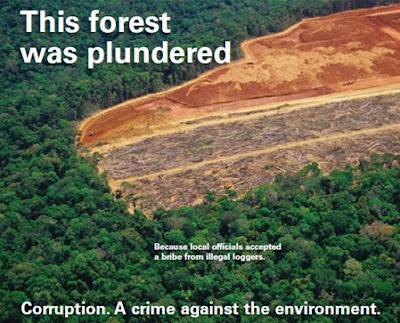 This film had its premier in the New Zealand International Film Festival in July and was also screened at the Oceans, Islands and Skies creativity and climate change conference at the University of the South Pacific in September. Sadly, not one local Fiji journalist took the trouble of seeing it, let alone write about it. It has already won four awards in 2010 and was the runner-up as the best political film for the AOF Festival 2010. Independent new website - Taimi Media Network Online: This new website is a hybrid offering from both the feisty independent newspaper Taimi ‘o Tonga and the government-owned Tonga Chronicle and TMN-Television 2. Congratulations Kalafi Moala and his team. This could not be better timed as the momentous post-election changes are settling down in Tonga. Scrutiny is needed now more than ever. Also, a special mention of the Pacific Media Centre’s new revamped regional website: www.pmc.aut.ac.nz – unlike some of the regional media websites, this is genuinely independent and carries no vested interests baggage. PORT MORESBY resident and local wit Alan Robson passed on this "Coconut Krismas" image, thanks to the the PNG branch of the Malaysian logging giant and newspaper publisher Rimbunan Hijau. So on that note, Café Pacific is sharing the image and wishing all its readers all the best for the Festive Season. Pacific-based journalists struggle to adequately play watchdog in countries rife with public and private sector corruption, according to Fiji media stalwart Shailendra Singh. Despite highlighting a few standout cases of well-executed investigative journalism in Fiji, Singh called for more Fourth-Estate style journalism in the country during his presentation at the MIJT conference held at AUT University. 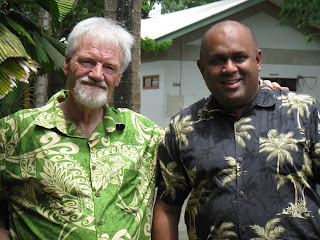 The experienced editor and media academic said one of the key reasons investigative journalism needed to be encouraged was because good governance was a major problem in the Pacific. He referred to “daunting figures” from the 2006 Australian Treasury Department report which said Pacific countries had squandered $US75 million since independence through poor governance. Singh, head of the University of the South Pacific journalism programme, said there was “no shortage of material” for investigative journalists to work in the region - official corruption and abuses were widespread and there was an “ample supply of dubious politicians and businessmen”. Fiji “does not have a strong history or culture of investigative journalism but there are some outstanding cases where research and in-depth reporting resulted in major exposes,” he said. “A lack of training, depth and experience in newsrooms” prevented journalists from undertaking more comprehensive research. In addition, he said, “promotion and pay rise is often based on the number of stories reporters produce in a day” and journalists are encouraged to focus “on daily news rather than chase stories that might not yield anything”. In a similar vein, Patrick Matbob, a lecturer in journalism at Divine Word University in Papua New Guinea and also in attendance at the conference, said investigative journalism was not strong in his country. Media organisations in PNG had traditionally not encouraged a culture of strong investigative journalism due to a lack of resources, he said in his paper at the conference. According to Matbob, the woeful state of some government agencies also limits the progress of investigative journalism in PNG as well as any potential positive effects. He said inefficiencies within state organisations prevented journalists from easily obtaining the information and data they needed when investigating stories. In addition, these organisations often did not “follow-up and take action after the media have revealed some illegal activity or wrong doing”, and no meaningful change occurs as a result of the little investigative work that is carried out, he said. 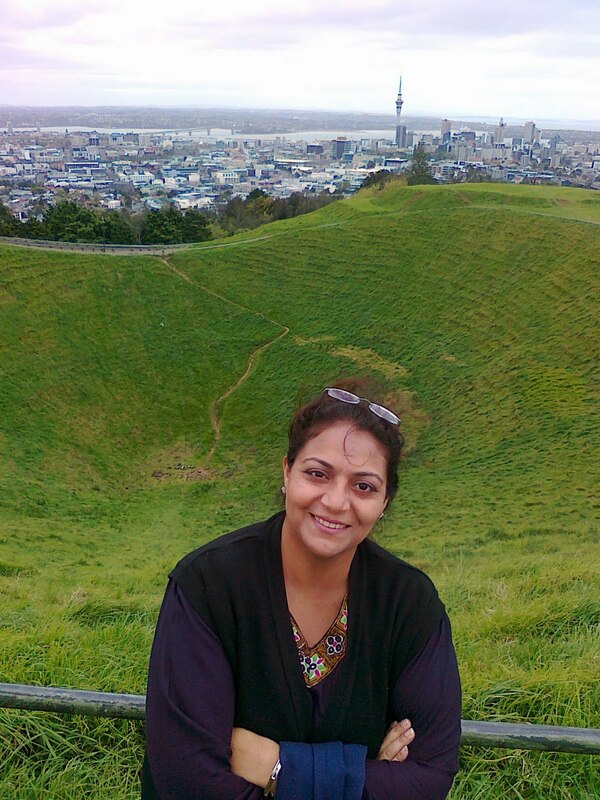 Singh said government regulations discouraged Fijian journalists from digging deeper. Recently decreed punitive media laws, introduced by the Banimarama government, were, he said, detrimental to investigative journalism. “They prescribe hefty fines and jail terms for journalists who publish material that is ‘against public interest or order, or national interest’. “Government and media can have conflicting views about what is in the national interest,” Singh said. However, Singh believes new media technology could be used to overcome censorship barriers. 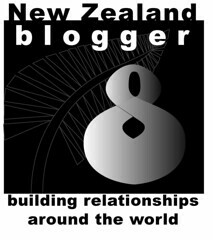 In Fiji, access to the internet was improving and a blogging culture was emerging, he said. Matbob talked of a new era of investigative journalism in Papua New Guinea, aided by the internet and taking place outside of mainstream media. The advancement of new media, he said, had shifted the definition of who could be a successful investigative journalist and had provided a fresh method to hold powers to account. Internet-savvy young people, who were “well-educated and concerned about the future of their country”, were increasingly taking on the role of “citizen journalism” and, by self-publishing on the web, were forcing public officials to be more accountable. “The new media’s ability to disseminate information instantaneously was having some impact on public opinion and causing PNG leaders to be wary of their behaviour and actions,” he said. The United States Embassy in Fiji funded both Singh and Matbob’s participation in the conference. Another speaker, former Fiji Daily Post publisher Thakur Ranjit Singh, delivered a research paper about the “coup culture” in Fiji and how it had impacted on investigative journalism in the country. He called for a stronger commitment to investigative journalism in the country and better training of journalists throughout the Pacific. SUDDENLY “peace journalism” has emerged as the flavour of the month in Fiji – and has even had a debut in New Zealand as an idea. A panel of local Fiji journalists at last week's University of the South Pacific seminar admitted they knew little about the approach. And, to be frank, were a little distrustful , as many journalists often are when confronted with a new concept and their natural skepticism pushes aside rational argument. One journalist admitted she had asked around her newsroom (Fiji’s largest) about what peace journalism was. The answer: “Journalism about peace” - a rather unhelpful contribution from a colleague. In spite of the visit of the celebrated author and media theorist about peace journalism Professor Jake Lynch, director of the University of Sydney’s Centre for Peace and Conflict Studies , to Suva late last month (and considerable publicity), there was little idea that the notion is about community “empowerment” and actually plain good contextual journalism. The sort of journalism that helps find solutions, rather than adds to a community’s problems. Traditionally, the Citizens Constitutional Forum and numerous other advocacy groups would do what they call hard-hitting advocacy. And they would take a stance which was very directly critical of the government for example. Now that's one way of ventilating [civil rights and social] issues, and it would fit with expectations among journalists of the kind of role they might play given that Fiji's media probably inherited a lot of its assumptions from the British system. But it's certainly not the only way to ventilate those issues. And what I've been encouraging them to do is to think how they can arrange for the kind of testimony and perspectives of people at the grassroots, people who are dealing with these issues in everyday life to be more widely known and more widely appreciated, and thereby contribute to a national conversation in Fiji about the issues on their own merits. It doesn't necessarily have to be fed through the filter perhaps familiar to audiences in Australia, where so many issues are wrapped around a claim by the opposition and a counter claim by the government, that kind of thing. 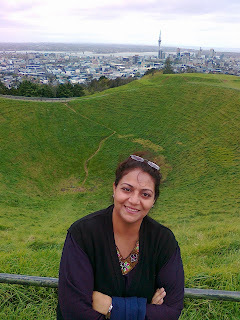 Barely a week later, at the inaugural Media, Investigative Journalism and Technology conference organised at AUT University by the Pacific Media Centre, the first-ever “peace journalism” seminar was staged in New Zealand – convened by a doctoral candidate from Pakistan, Rukhsana Aslam (pictured) and Dr Heather Devere of the National Centre for Peace and Conflict Studies at Otago University. 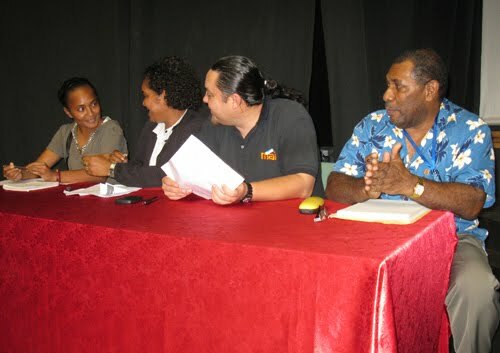 Aslam, who has contributed a chapter on peace journalism education to a new book Peace Journalism, War and Conflict Resolution, was well supported by Shailendra Singh of USP, One Television’s Koroi Hawkins in the Solomon Islands, and Taimi Media Network chief executive Kalafi Moala among others. Peace journalism or conflict-sensitive journalism education and training ought to provide a context for journalists to ensure that both sides are included in any reports. The reporting would also include people who condemn the violence and offer solutions. Blame would not be levelled at any ethnicity, nor would combatants be repeatedly identified by their ethnicity. But the reporting would constantly seek to explain the deeper underlying causes of the conflict. 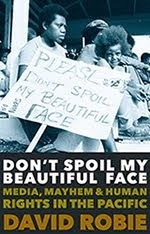 This approach to journalism surely could offer some hope for conflict resolution in the Pacific and a peaceful future. Pictured above: David Robie and USP graduate journalist Joe Yaya, now with the Pacific Conference of Churches.